I have so many fun and exciting things to show you guys in the near future, but I thought I’d do a little bit of a retrospective today. 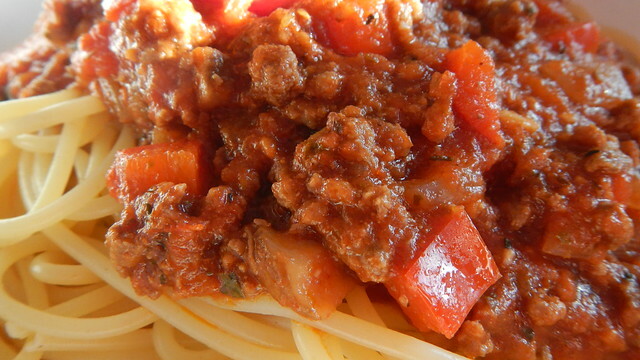 My very first entry on this here blog, five-plus years and 900-odd posts ago, was a recipe for spaghetti bolognese. 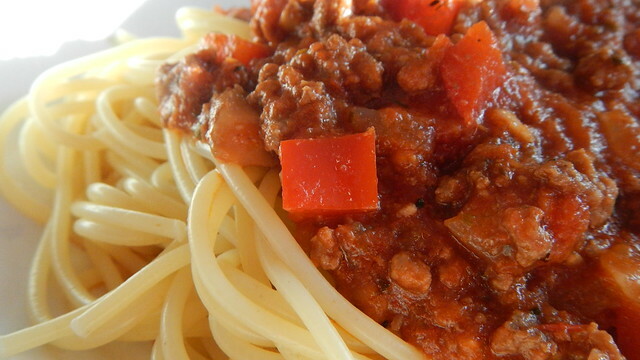 I make this spaghetti sauce all the freaking time, so I thought I’d do another post just to show you how things have changed over the years, but they still remain in essence the same. For one, the Pie and I went vegetarian for a month when I made that post so there’s no meat in that sauce. 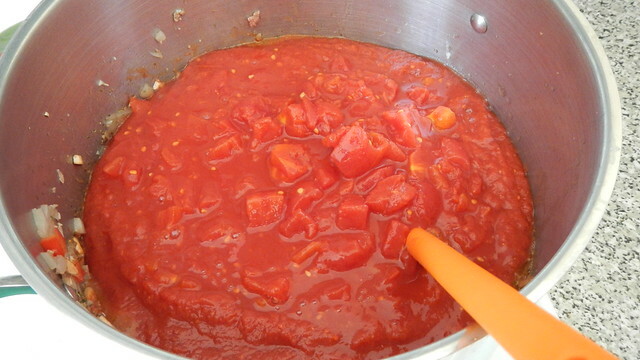 For another, I was way lazier when it came to chopping things up, so my sauces were much chunkier. I like them a bit more uniform these days. 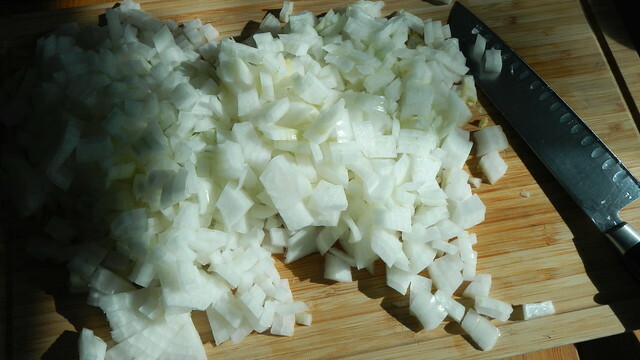 Some things stay the same, though: I always load it down with diced onions to start. I made a crapton (a metric measurement of course) of this so that I could freeze it so I can’t give you exact measurements. Just lots. 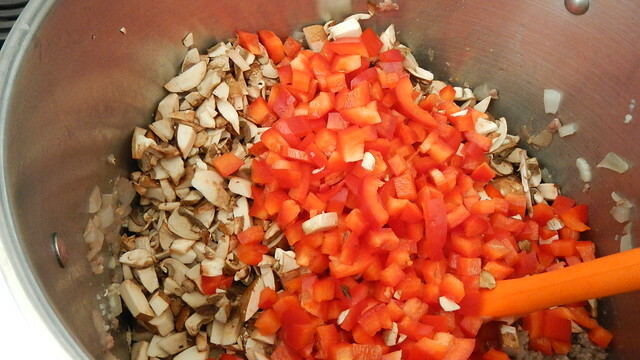 I always add diced red pepper (I’m allergic to green) and diced mushrooms. You can add whatever you wish, though. Sometimes I chuck in whatever’s in my fridge that needs to be used: avocadoes (they add a nice thickness the sauce), tomatoes, sometimes even carrots. 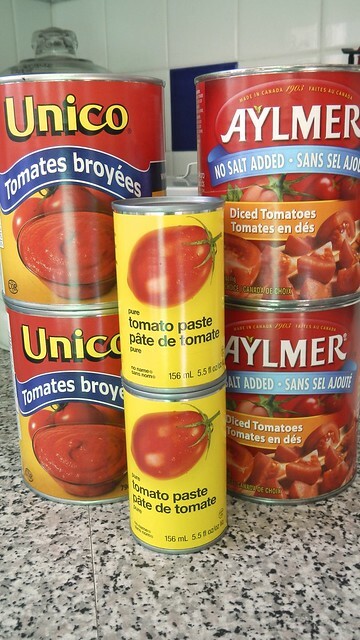 And then of course a variety of tomato-based canned items. 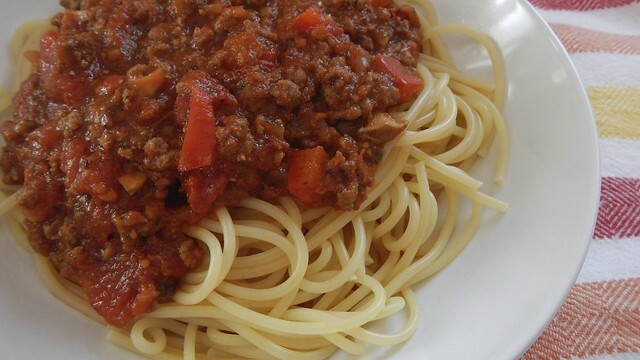 I used to use jarred spaghetti sauce as my base but I found they were sneaking green peppers into the mix and it wasn’t doing my digestive system any good so I switched to canned crushed tomatoes, tomato paste, and canned diced tomatoes. First I start by sautéeing up the onions with olive oil and a little butter. I let them go until they’re smelly and soft. 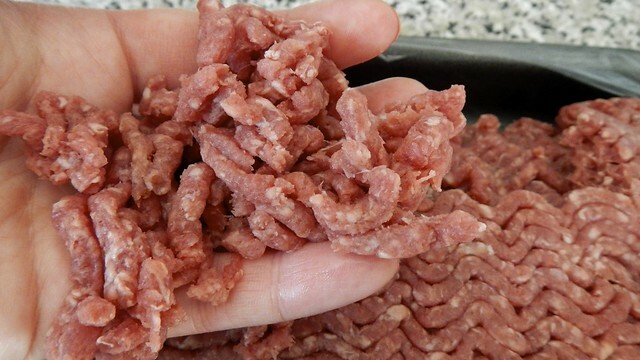 Then I pull apart a large hunk of lean or extra lean ground beef. I like to break it up with my fingers to ensure that there are no big chunks in the pot. 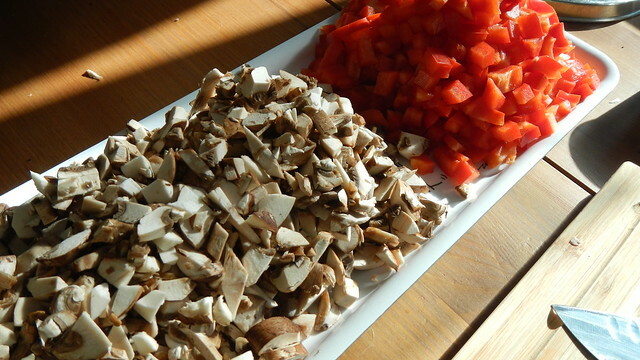 You can also use ground turkey or pork or whatever works for you. If you’re going the veggie route and using TVP, add that last. After the meat is browned to my satisfaction I tip in my vegetables, as well as some minced garlic, salt, pepper, and various spices. 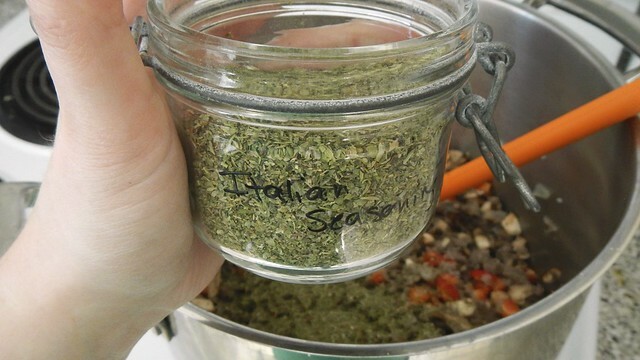 I like a mix of italian spice plus extra basil. 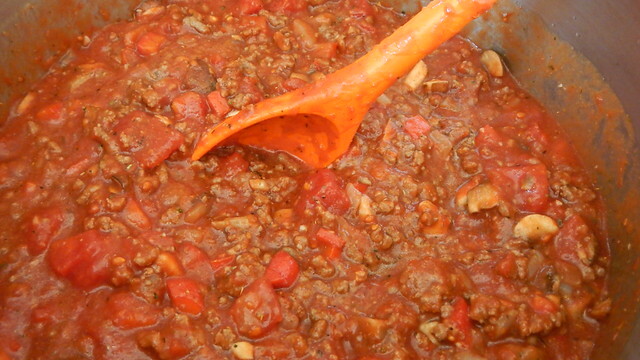 I add in all my tomato things as well and give that a grand old stirring. 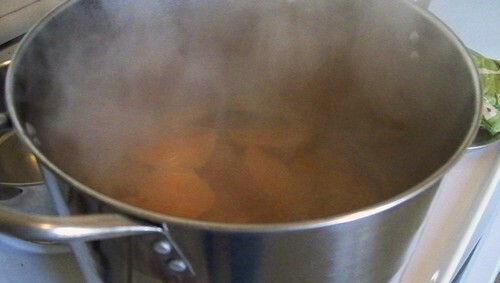 Let that simmer for at least half an hour so the flavours can mingle, and feel free to adjust the spices as you see fit. I like to let it simmer as long as I can, but it’s good either way. Cool and freeze or serve hot on top of your favourite fresh pasta, baked into a pasta casserole, or glopped on top of bread as a sloppy joe! I’m trying out some of the neat settings on my new wee camera. This is one of the shots where I ventured out of Easy Auto Mode. This is a big step for me, people. And did you know my wee camera has a FOOD setting? No longer do I have to frantically compensate in post-production for the lack of light on this ocean-bound rock: I can do it all before I even take the picture! Awesome. And these shots don’t look half-bad, considering it was a cloudy morning. This recipe comes from Lexie’s Kitchen and I totally LOVE it. Well actually, I didn’t end up using her recipe at all, but the idea was fantastic. You know when you’re looking for a little something extra in the morning but you want something easy, and for once, you (gasp!) don’t want any bacon? 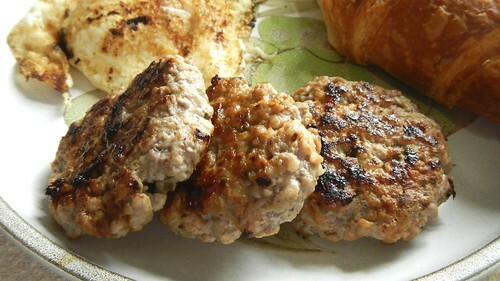 Why not try a breakfast sausage patty? 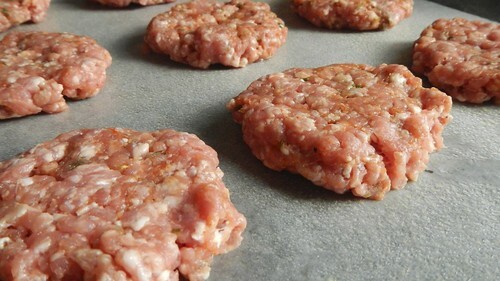 These ones are made with lean ground pork, but you can make them with any ground meat (bonus points if you grind it yourself). 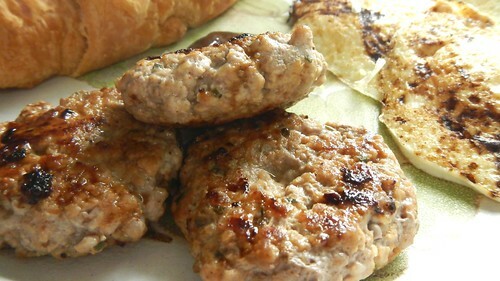 When Jul and Cait were here I made some with ground chicken, and added a bit of almond meal to improve the consistency. 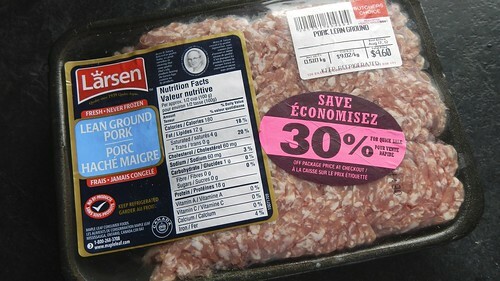 I bet moose patties would be worthwhile trying. 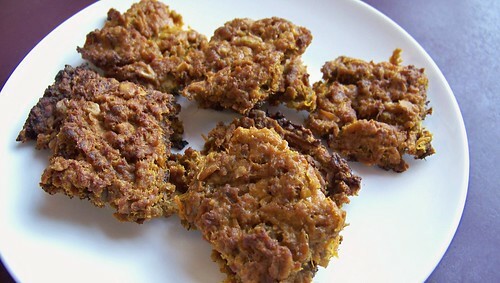 Some day I am going to figure out a nice gluten-free veggie patty. But today is not that day. 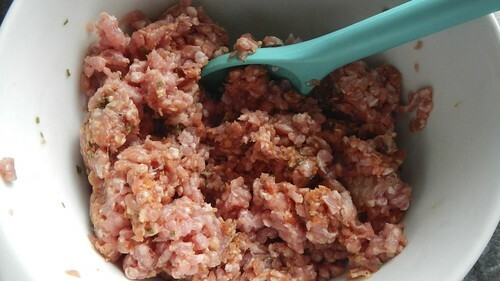 So you take your pork and you plop it in a bowl. Add some spices. Or whatever. I used some paprika, ground garlic, dried chives, and then some Worcestershire sauce and some sweet and spicy Tabasco. Then I added a pinch of sea salt and a lot of black pepper. 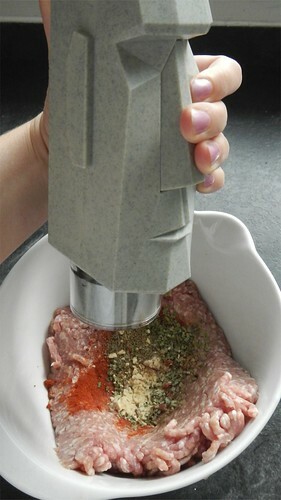 Isn’t this grinder awesome? Cait brought it for me. You press its nose and it poos out pepper. Moai pepper anyone? Stir all that goodness together. 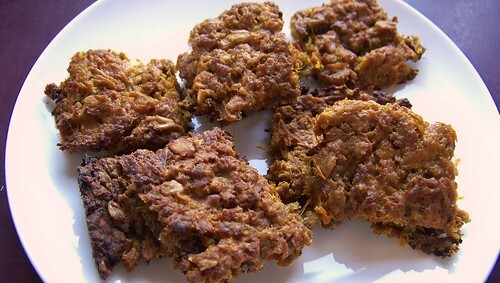 Then make yourself a bunch of wee patties. Any size you like, really. 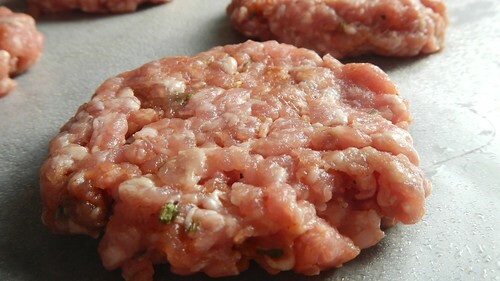 Just remember that the thinner they are the faster they cook up, and the harder they are to move around when raw. 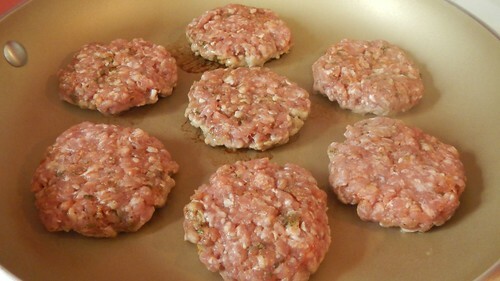 I suggest spraying a sheet of waxed paper with cooking spray to hold your patties until you’re ready to cook. You can save yourself some time in the morning and make them the night before — just cover them with an additional sheet of sprayed waxed paper and chuck ’em in the fridge. The rest is really quite simple. 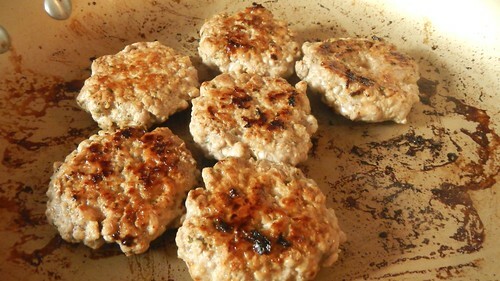 Plop the patties in a heated frying pan (non-stick works best) and cook for a few minutes, flipping once or twice, until they are done all the way through. My non-stick pan is so good that when I was flipping the patties, one of them *may* have accidentally taken a flying leap out of the pan and smashed itself to a million pieces on the floor. So Gren *may* have gotten a bit of extra breakfast this morning. 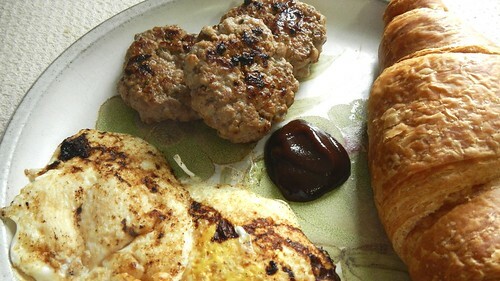 We served ours with a bit of barbecue sauce, some eggs, and a big ol’ croissant. But I’m sure what you have planned is also good. Enjoy! 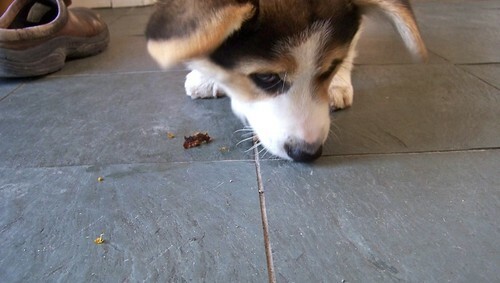 In honour of Ruby’s first birthday, Cait and I got together and concocted some fabulous dog biscuits for her and Gren. 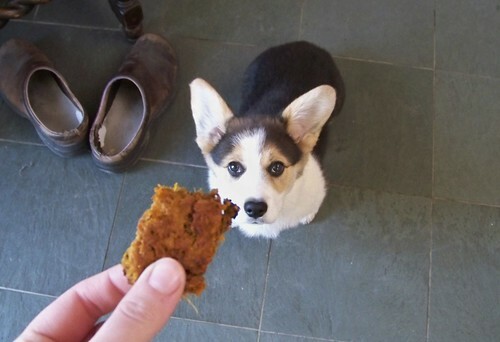 Being a corgi and therefore very food-obsessed and prone to obesity, Gren only took home a few to try, but they were still enjoyed by all. I even had one, as I won’t feed my dog anything I wouldn’t eat myself. 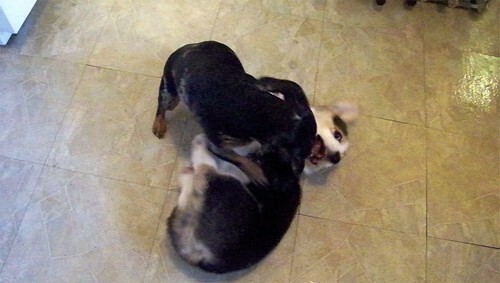 Fortunately, we were able to easily find a dog treat recipe online that conformed to our philosophy of feeding our dogs biologically appropriate food. That means most definitely no corn, no wheat, and no soy, and none of those other things that people seem to think dogs need, like salt, sugar, and artificial flavours or colours. 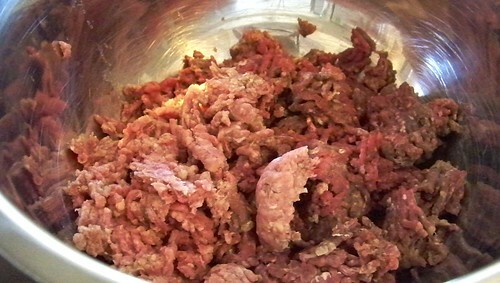 This recipe from Sandra over at dog-nutrition-naturally.com totally fit the bill and was easy to do. We tripled the recipe so that there would be plenty of birthday treats for everyone. 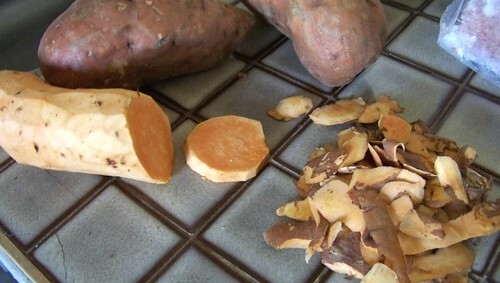 First, peel yourself a large sweet potato. And I mean LARGE. Cut that sucker up. Plop the potato pieces in a pot and boil them silly until they’re mashable. Then of course mash them. Preheat your oven to 350°F and lightly brush a rimmed baking sheet with olive oil. 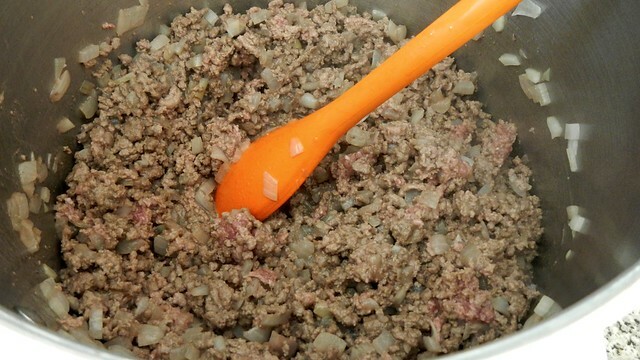 In a large bowl, plop in 1lb ground meat. We used extra lean ground beef, but you can use turkey, chicken, pork, or lamb — or really, whatever you want. Add to that 1/4 teaspoon garlic powder (not garlic salt) and a large egg. 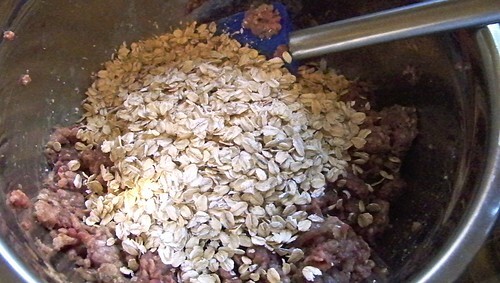 Drop in 5 tablespoons large flake rolled oats as well, just for cohesion purposes. 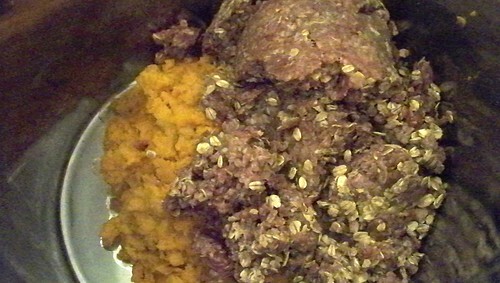 Chuck in the mashed sweet potato and mix it well. 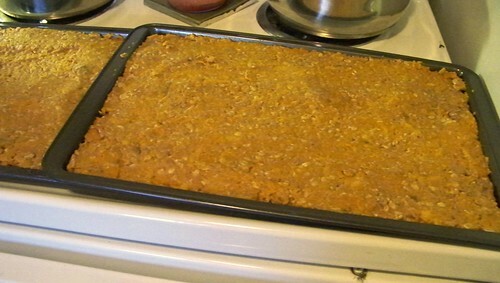 Spread it flat on the prepared cookie sheet and smooth the top. Bake for about an hour. The cookie will shrink and pull away from the sides. Now you can score the cookie into smaller pieces, or use a cookie cutter to make fun shapes. A pizza cutter is handy about now too. Reduce the oven heat to 250°F and pop the cookies back into the oven for another hour or so to dry out. Keep an eye on them so they don’t burn. Tada! That’s it. Now SIT. Good dog. Make sure to store your treats in an airtight container, and of course remember that treats should never be used as a substitute for your dog’s regular diet. Yum yum!